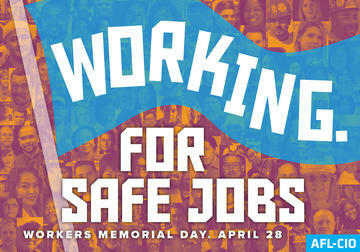 On April 28 we observe Workers Memorial Day to remember those who have suffered and died on the job and to renew the fight for safe jobs. This year we will come together to call for work in this country that is safe and healthy and pays fair wages. We will celebrate the victories won by working people and commit to fighting until all workers have safe jobs and the freedom to organize without the threat of retaliation. The Workers’ Center of Central New York is part of a coalition organizing several events to mark Workers’ Memorial Day and May 1st. International Workers Day. We hope you will join us to one or all of these events. Thursday 4/28/16 To the streets for safe jobs on Workers’ Memorial Day! Join the WCCNY for a day of outreach in the streets of Syracuse and farms nearby to bring the message that we all deserve safe jobs. Call us at 315-217-5708 if you would like to be part of the outreach team. At the breakfast, we’ll honor the 35 workers who’ve died in this area since January, 2015, and present the following awards. Among the honourees are Crispin Hernandez and Saul Pinto, members of the WCCNY who bravely resisted intimidation at Marks Farms! Pensabene’s Casa Grande 135 State Fair Blvd. 6pm to 8pm at Legal Services of CNY office – 221 S. Warren St., Syracuse, NY 13202. 90 minutes before he was killed on his first day as a temp worker, 21- year-old Day Davis texted a picture of himself to his girlfriend, excited for their future. An investigation reveals the troubling issues that led to Day’s death and how the $100 billion temporary staffing industry is putting millions of American workers at risk. All temporary workers are invited to our first Temp Workers Appreciation Day at the WCCNY. Temp workers work extremely hard in a number of demanding jobs, but often times they are paid less than their permanent worker counterparts. Temp workers also face higher rates of workplace related injuries and deaths on the job. Temp workers, like all workers, deserve jobs with dignity and jobs that are free of hazards and injuries. Are you a temp worker? Come to Temp Worker Appreciation Day! We will be raffling gifts, eat great food, and talk about how to make the working conditions and lives of temp workers far better than what the status quo currently offers. Please share this event and tell any friends who are currently working for a temp agency to join us. For information about any of these events please call the Workers’ Center of Central New York at (315) 218-5708. This entry was posted in Workers Memorial Day, Workplace Health and Safety. Bookmark the permalink.